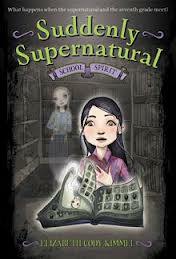 Here’s a cute series for your tween/middle school girls who love a mystery and some supernatural powers thrown in. This series has been flying off the shelves since I brought it into the library a few months ago. I just had to read it to see what the fuss was about. At first I found the “mean girls in middle school” a little boring, but I liked the main character, Kat, and her new best friend, Jac, a gifted cellist. Kat finds out that she is able to see spirits like her mother, who is a medium. Although she is reluctant about her new gift, she and Jac end up solving a mystery. This book is fast-paced and fun. I liked the mystery and didn’t mind the “not subtle” hint that there is a sequel on its way. Lucky for my students that there are actually four books in the series – all on my shelves. My only worry with this series is that it will date itself with its references to modern music.